Wedding bouquet using white ranunculus, avalanche roses mixed with dill and mint. Bouquet using avalanche roses and white ranunculus with variegated foliage and ivory satin ribbon. 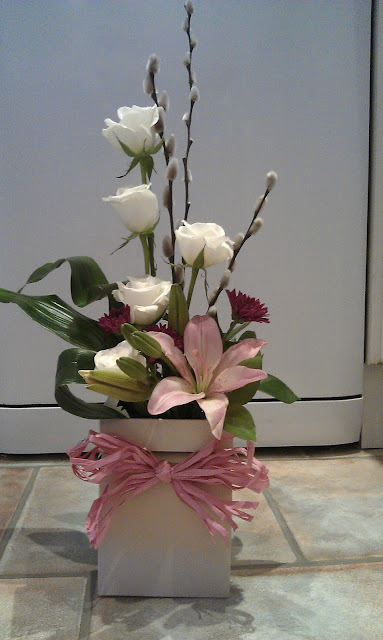 This is a table arrangement I did for the Valentines meal I had with my husband. I have used a black glass square vase, red medalino sticks, red spray roses and carnations with dark green foliage. To add a bit of texture I wired some black feathers and dotted them throughout the design. I also had some large heart shape diamante buttons that I added for a bit of bling! These were the arrangements I did that were fastened to the gate posts at the entrance to Graham's mums house for is funeral. 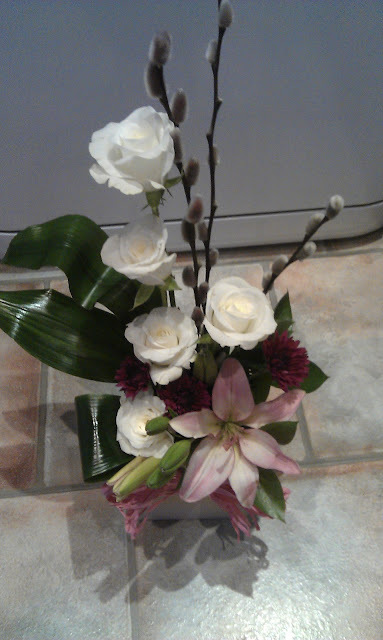 My friend Emily very sadly lost her big brother Graham and I was honored to be asked to do the flowers for his funeral. They asked for all white flowers including Roses and Lilies. I also used snap dragons, lisianthus, aspidistra leaves, leather leaf and ivy to create this coffin spray. Posy pad for Graham's funeral inspired by Blackburn Rovers football shirt which is half white and half blue with the Lancashire red rose badge. Graham's funeral flowers in the colours of his favourite football team- Blackburn Rovers.